Do you want to convert your Visitors into Social Followers? Well, it is the dream of every blogger to get as many social followers they can. Mostly they use different services to buy Real Social Networking Fans, but those fans neither Comment or like any status updates. Therefore, the ideal way to convert new visitors into Social Followers is to utilize Different Social Networking widgets so anyone can easily use them without any hesitation whatsoever. On the other hand, by adding lots of Social Widgets it could affect the speed of a website. Keeping that in mind, Our MBL Developers have created a Remarkable Widget that has all the Popular Social Networking websites. Sounds great? Indeed. 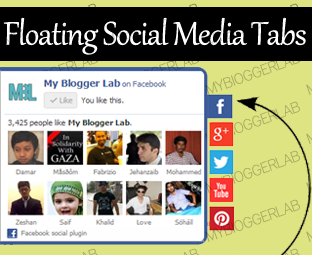 Today in this Tutorial, we will integrate Social Media Tabs in Blogger Enabled Website. Where This Social Tab Will Appear? Before, we get on to our Tutorial let us first learn where this widget will appear in a website. Since, this is a Tabbed Widget. Therefore, it is extremely small in size so it wouldn’t take a large space on a website. We have integrated a Slide out Functionality that would produce sparks in the eyes of visitors. It will appear at the Top-right side of the screen. To clear your concepts, we have included a screenshot. Consider the following screenshot. How This Floating Social Tab Looks Like? Since, it is a tabbed widget. Therefore, it will appear in a form of a strip. However, when someone will select their personal favorite Social Networking website it will slide out all the details about it. For Example, a person Press “Facebook Tab” then, it will display the latest status updates and the like button. Take a look at the following screenshot. The steps mentioned below are extremely straightforward, and it would hardly take less than 10 minutes to complete the integration. We have tried our best to minimize the steps. So, let us start with our tutorial. Consider the following steps. Now In the template search for ]]></b:skin> and above it paste the Following CSS Code. Then Save the Template and proceed to the next step. How To Add Floating Social Tab Widget in Blogger? Replace http://www.facebook.com/mybloggerlab with your Facebook Page URL. 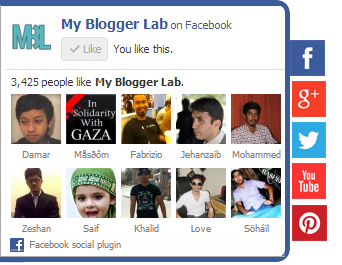 Replace mybloggerlab with your YouTube username. Replace http://www.pinterest.com/fosterzone with your Pinterest profile URL. All Done: After doing all the customization its time to Save the widget, just press the Save Button. That's it, go a head and checkout your website. We are sure you will enjoy the picture perfect result. Question#1: It would Work on WordPress? Hope you guys have enjoyed the tutorial. Well, this widget was extremely extraordinary for our team because it took a lot time to develop. We failed again and again, but the end results were remarkable. However, today our team nailed it. What are your thoughts about the Social Tabs? Take a lot care till then, Peace, Blessings and happy Tabbing. Its nice to see you Faizan Buddy..Thanks for liking it Peace. Pre cool . but how can i use this on tumblr ??? was waiting for this !! A perfect widget, MBL Always comes up with awesome , mind blowing widgets and designs ! One word : Awesome! Please tell how 2 brand images? Thanks Again Syed. God Bless! We will soon write a tutorial on it! brilliant widgets ever bro..thanks for sharing..
when i click on icon nothing is coming out. It is working perfectly on our Demo and other Blogs. There is problem in your Template. or coding is conflicting with each other. i am getting a problem that its not showing the contents of my google+ profile. To Make it Work, Do As Mentioned Below. 3.Then upload the File to your Web Host renaming the File to MBL-slideshow.js. Thanks a lot buddy. i thought the same but not wanted to damage your script. by the way in javascipt actual url is this that should be changed. Don't change the URL. Just Replace The Google PLUS ID. Its a really nice widget. I was wondering if it is possible to add a linkedin tab there. Is it possible ? Love it. How about Instagram integration? Thank you so much for this. It's hard to find a social tab slider for free. Is there a way where we can show the contents of our facebook page or account in the tab slider rather than show the people subscribed? Thanks! You might have 2 conflicting Jquery. Btw, I don't how but yesterday my tab for google+ shows my contents after following your instructions for that MBL-slideshow.js thingy. But now, I can no longer see my contents. I wonder what has gotten wrong. Any ideas? That site is on WordPress. They might be using PHP. Though, we have told our team to code a Social content slider. Hopefully, they would come up with something new. That Google+ Tab is not showing due to the fluctuation in Google+ API. I just figured out how to change my preferences in the facebook box.Turns out it was rather easy. I just have to change data-stream="false" to "true"
It only works once bro! any help?? first of all - I love the widget and it works perfectly for my website. However, I have noticed that when browsing my website on tablets or mobile devices where it is touch-screen oriented, the sliders slide out but have trouble going back in. I think a solution to this issue would be to have to slider open and close when one clicks or touches the social media icons. How would I go about tinkering with the code to make this happen? Actually, this doesn't needs a close button as it works on Hover so along as your device is touch friendly it would work just fine. However, this gadget is not so optimized for gadgets like Tablets and Mobile devices. Though, it works fine on one of my device. We would roll out improvement in the next version of this widget. Nope, That Can't be changed in position! So this thing does have a lot of bugs and it does not look completed, or you hid something on purpose. I am having trouble, and I can't fix it until I buy a hosting plan to move the scripts onto my server, but I noticed 1 piece of code that stood out and I want you guys to finish it and that is this. This is a code for linked in which means the next release of your widget will include it. I would add it myself, but I need to get a hosting plan. I can bet you were going to use this for the summary code on linked in to add a more professional look to your widget and to the sites using it. You guys are clever, and I am awaiting the next release. Sorry to point this out but I managed to fix the broken code for blogger users, and it was very very easy I made it to complicated. I am currently working on having more than 1 youtube widget, and I believe i can already fix it. So good job on the code and here is proof of my fix not sure if you guys want the code or if I should publish it? Google+ and Twitter work now but great template next I will work on adding a Linkedin page to your widget love the artwork of this piece keep it up. Today was the first time I followed a blog, and this was it (no joke)and I am glad to see innovation through coding. Yes, We're working on a better version. Stay tuned. Would release it very sooner! that's great widget, how if i just want put this widget in sidebar? That's not possible with the current code! this is sheethal having blog on movies www.thecinesizzlers.com,all widgets in my blog are working but only one thing im losing i.e when am trying to insert recent post widget with hover effect .its not working because already running ajax feature post slider in top my site.may be conflict between each other .let me give suggestion and resolve the conflicts between two.